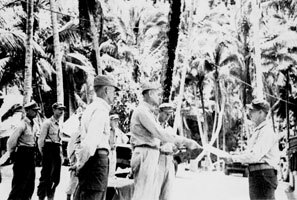 LTC Frederick W. Bradshaw (R) greets MG Fred H. Osborne, Director of Morale Services Division, War Department, at the ASTC, Fergusson Island, N.G. January 1944. 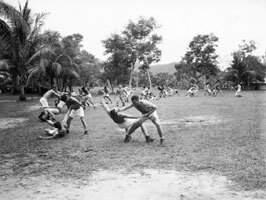 Candidates practice hand-to-hand combat skills at the ASTC, Fergusson Island, New Guinea. Jan 1944. 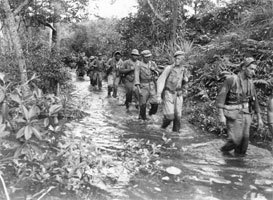 Alamo Scout candidates on a 26-mile jungle march. 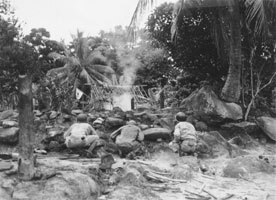 Fergusson Island, N.G., February 1944. Alamo Scout instructors observe hand grenade training at the 1st ASTC on Fergusson Island, N.G., January 1944. 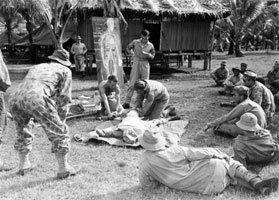 Dr. Richard Canfield (standing) instructs Alamo Scout candidates in advanced jungle first aid under the watchful eye of LTC Frederick W. Bradshaw (hands on knees). Fergusson Island, N.G. 1944. 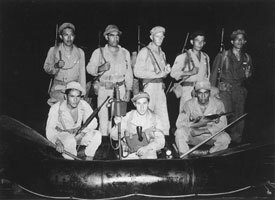 A fully-equipped Alamo Scout team prepares to conduct a night reconnaissance during the first training class at the Alamo Scouts Training Center on Fergusson Island, New Guinea. Front row left to right: PFC Joseph Johnson, 1LT Michael Sombar, and CPL David Milda. Back row left to right: SGT Byron Tsingine, SSG Alvin Vilcan, CPL John A. Roberts, CPL Walter A. McDonald, and SSG Caesar Ramirez. 8 Jan 1944. 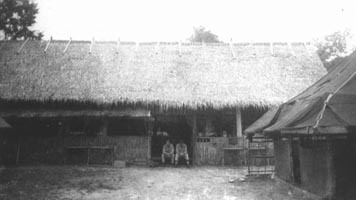 Day Room at the ASTC at Subic Bay, Luzon, P.I., 1945. 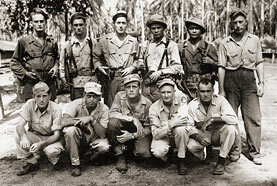 Members of NELLIST and ROUNSAVILLE TEAMS upon return	from Cabanatuan. 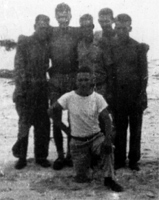 Top L-R: Gil Cox, Wilbert Wismer, Harold Hard, Andy Smith, Francis Laquier. 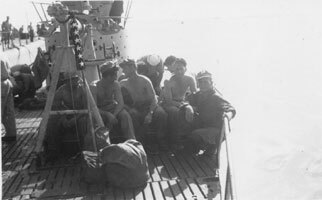 Bottom L-R: Galen Kittleson, Rufo Vaquilar, Bill Nellist, Tom Rounsaville, Frank Fox. (Thomas Siason, Bob Asis, and Alfred Alfonso not pictured). 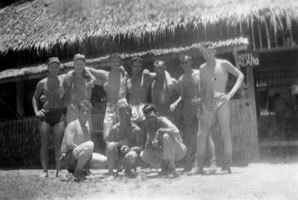 Luzon, P.I., Feb 1945. Team leaders Bill Nellist (L) and Tom Rounsaville (R) after the Cabanatuan Prison liberation. Feb 1945. 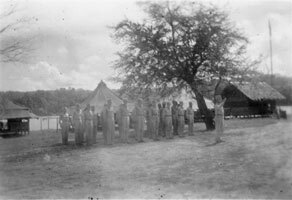 Alamo Scouts in camp. Subic Bay, P.I. 1945. Awards ceremony, ASTC, Luzon. 1945. 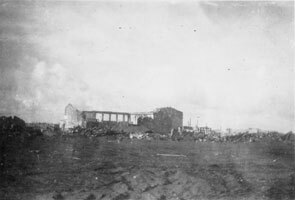 Bomb damage of Legaspi, Luzon, P.I. following saturation bombing request by Nellist Team, March 1945. 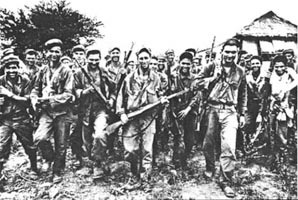 Publicity photo of Army Rangers following Cabanatuan Raid, Luzon, P.I., February 1945. 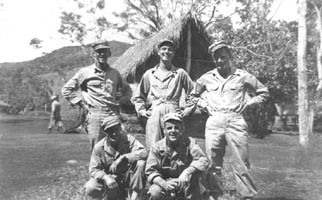 Alamo Scout Lt. Michael Sombar (lower right) with unidentified officers, New Guinea, 1944. 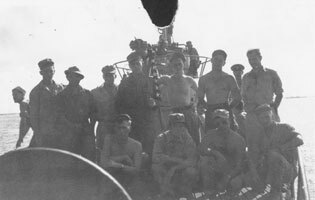 Officers and enlisted men of the multi-service team pose for a photo at Seeadlor Harbor prior to leaving for Sansapor aboard a submarine. Alamo Scout Lt. George Thompson is in the front row third from the left. June 1944. Alamo Scout George Thompson poses on the deck of the U.S.S. S-47 Submarine on the way to the Vogelkop. June 1944. Note the censor's removal of the submarine's communication array at the top center of the photo. 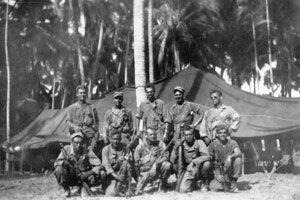 L-R: SGT Heinrick Lumingkewas, SGT Gordon Butler, SGT Herman Chanley, Lt (j.g.) Donald E. Root, and 1LT George Thompson on their way to Sansapor aboard the S-47, June 1944. 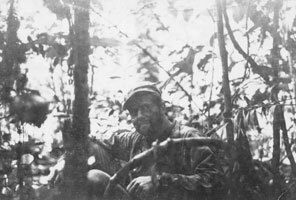 1st Lt. George S. Thompson somewhere in the Vogelkop. June 1944. Lutz Team: William B. Lutz, John L. Geiger, Clifford A. Gonyea, Oliver Roesler, Bob Ross, Robert E. Shullaw.